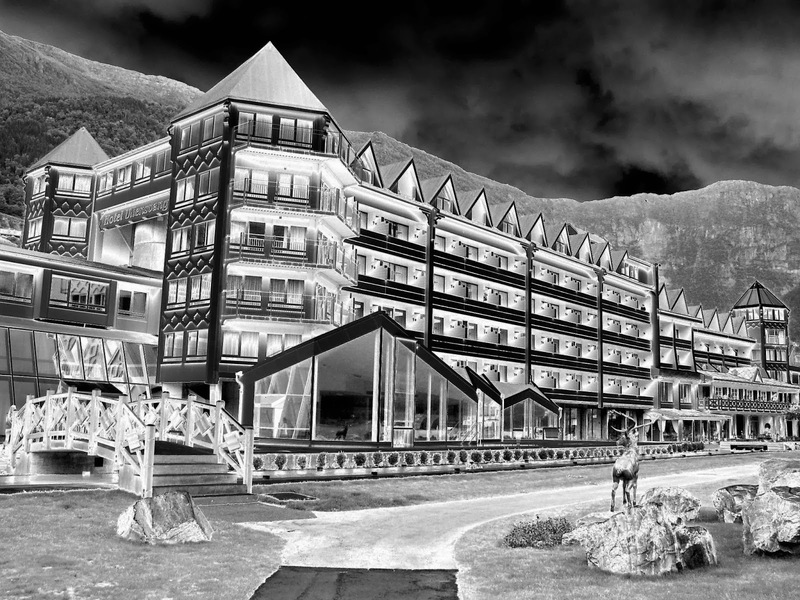 Kviknes Hotel in Balestrand looks positively frightening in this altered view. Photo: Kviknes Hotel. Effects: EuroTravelogue™. Creaking floors? Phantom maidens? Mysterious footsteps in the hall? Perhaps figments of your vivid imagination? Perhaps not! 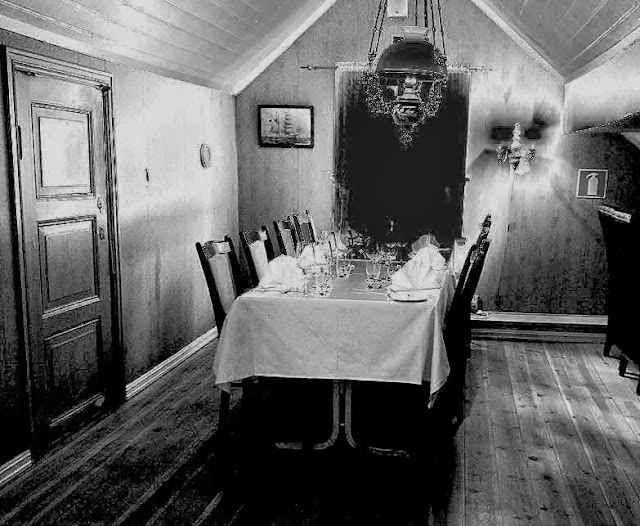 While on a recent tour through Norway last summer, inn keepers and restaurant managers regaled our group with their spooky tales of the happy haunts that frequented their establishments and from the first tale of a ghostly encounter, I was captivated. I wanted to hear more! And so I set out on a mission to seek out these ephemeral phantoms who exist between our world and theirs so I could share some haunting tales during this Halloween. I've also taken some unearthly liberties with my photos so I hope you enjoy these views from the "other side." 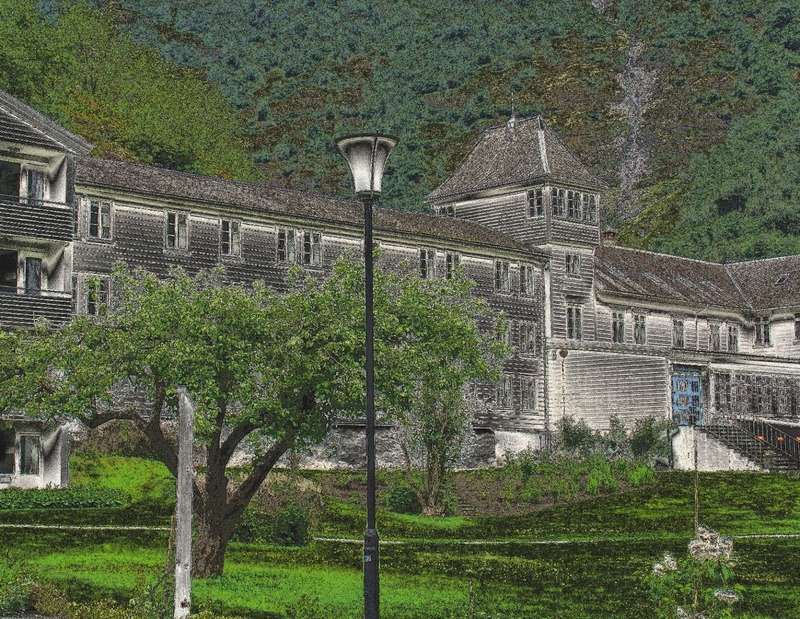 Dare to join me on a frightfully-fun ghost adventure in Norway? A chilling view of the Lothes Mat & Vinhus in Haugesund, Norway. After a day of touring the Viking Museum, King Harald Fairhair's monument, and Iron-Age settlements, our group of ravenous journalists set out for dinner. Our fabulous guide, Ingun Harloff from VisitHaugesund.no, led us to one of the most charming restaurants I have ever seen and eaten in—the Lothes Mat & Vinhus (LMV) overlooking the Smedasundet Sound in Haugesund; but looks can be deceiving. While you can imagine that this restaurant and neighboring bar have plenty of regular happy haunts, it's the one from beyond that captivated us all. Chills ran up and down my spine as we listened to our guide and server recount the strange goings on in the very room in which we were seated as well as the rest of the second floor. Boy, do I love getting spooked! The dining room where we had dinner and heard our first ghost story. Photo: Denise Dubé. Effects: EuroTravelogue™. Originally a residence built in 1850 by Ole Evensen, the building was ravaged by a fire in 1905 and sadly claimed the life of one man. While little is known about the man's mortal existence, his after life is one that shines in the spotlight for the staff of the Lothes Mat & Vinhus! His disembodied spirit is reputed to wander the second floor and what he lacks in visual spectral light, he makes up for in startling sounds often heard by the those working here: footsteps across the floor, drawers being opened and closed, glasses moving or breaking. Needless to say, the staff is afraid to be alone in the restaurant and I would be too! Do spirits wander these corridors at the Hotel Ullensvang? Leaving Haugesund, we were off to Lofthus to one of Norway's historic inns, the Hotel Ullensvang. This magnificent property offers stunning views of the Hardangerfjord and the nearby mountain glaciers. 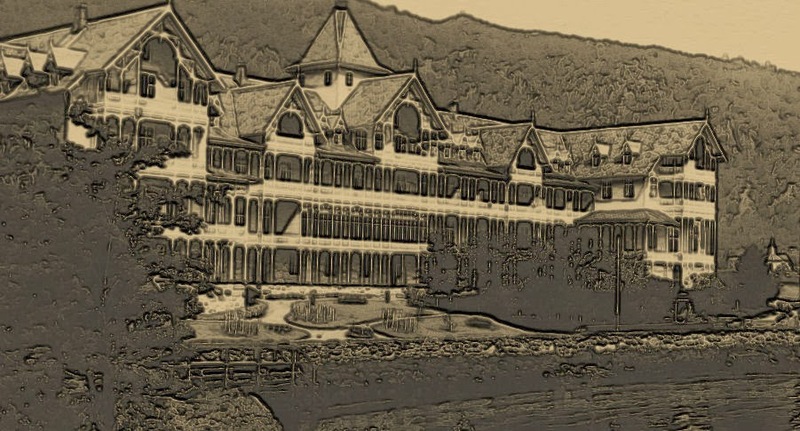 With a fascinating history that dates back to 1846, you would think that this hotel had a few or lots of haunted tales of its own. 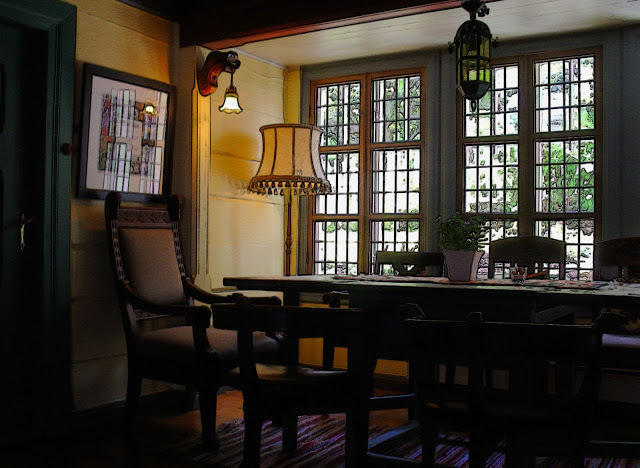 But after I questioned the owners about the existence of unexplained phenomena, alas, they had none but they did mention a ghostly tale of a nearby house that had a few haunts of its own, and not of the friendly kind either. The charming Utne Hotel in Utne, Norway, has secrets of her own. After a morning ferry ride from the Hotel Ullensvang, we stopped at the Hotel Utne in Utne for lunch. 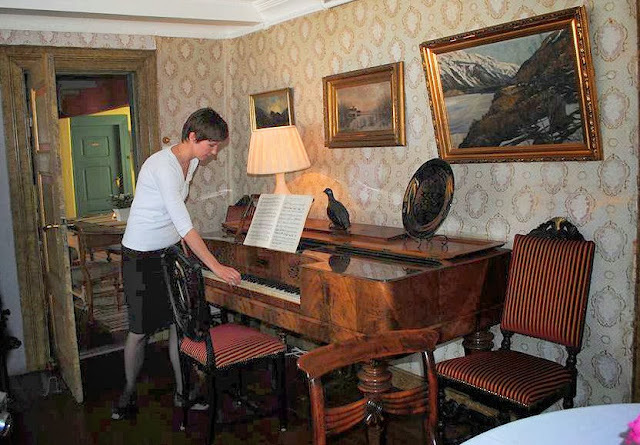 Before we dined, our gracious host and hotel manager, Bente escorted us on a tour through Norway's oldest hotel in continuous operation—since 1722. As we walked through the oldest parts of the hotel, I inquired whether or not they experienced any hauntings. Much to my delight, her response was a resounding "yes, we actually have two!" Bente then told us about "Mother Utne," aka Torbjørg Johannes Dotter Utne who ran the hotel for 70 years in the mid-19th century. Evidently, she still does. 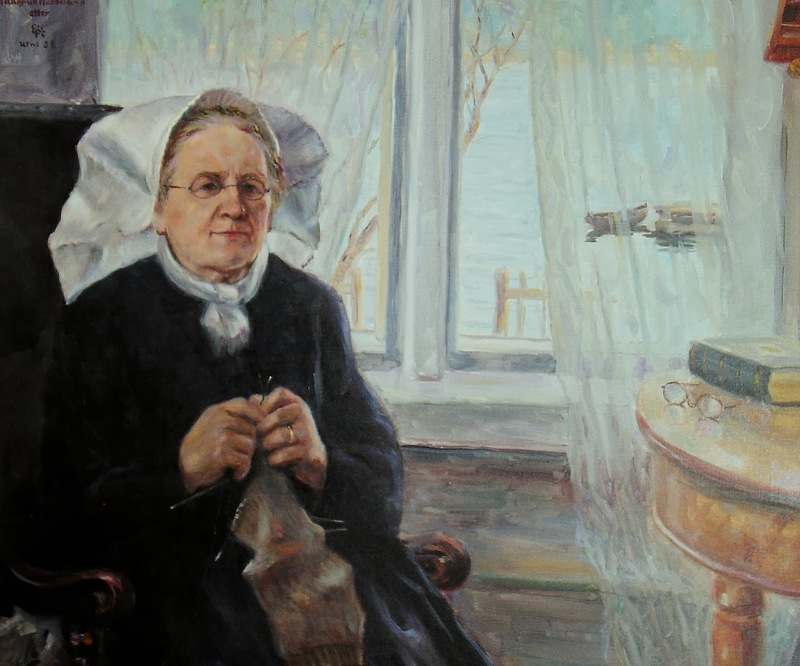 Returning objects to their rightful place or "her own proper place" is just one of the ways Mother Utne makes her presence known, however Bente also explained that she knows when Mother Utne is around because of the sense of warmth that pervades the room. Mother Utne spreads warmth at the Utne Hotel. Look very carefully at the flairs above the piano, one in front of Bente and the other to the right of the glow of the lamp. Could this be Mother Utne? Photo: Denise Dubé. Now hang onto yourselves, there's another frightful tale to be told, one that would make me book a night in Room 15 or the "Ghost Room" as it's now known. According to local legend, an 18-year-old girl jumped to her death from the window of this room and is reputed to make her presence known to guests quite often. While this may spook some, the Utne Hotel receives a lot of requests to stay in the "Ghost Room." Even though I am a scaredy cat because my imagination gets the better of me in situations like this, I would stay in this room BUT only if someone stayed with me. 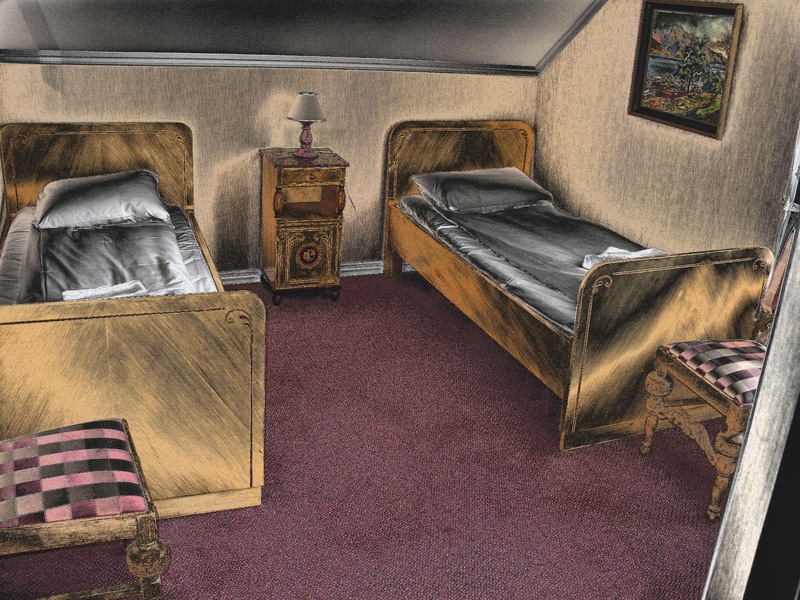 Would you sleep in Room 15? The stunning Kviknes Hotel in Balestrand. 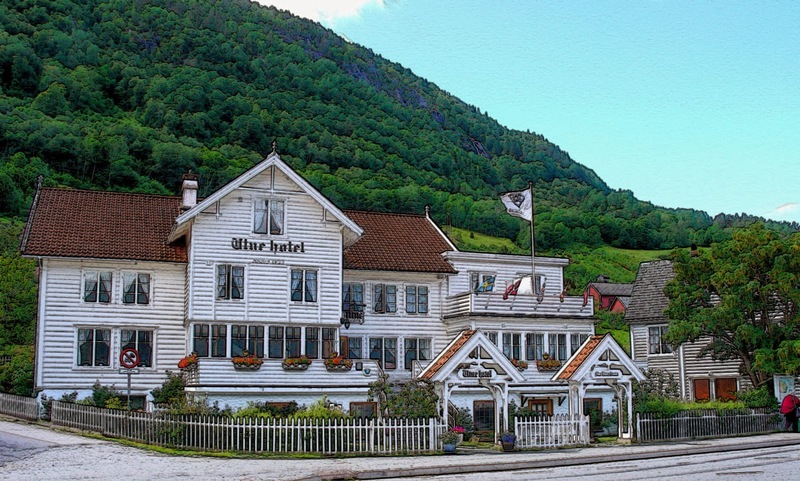 Perched on the shores of the Sognefjord, the Kviknes Hotel in Balestrand is one of the most picturesque of Norway's historic inns, the "Jewel of the Sognefjord" as it's known because of its exquisite "Swiss-style" architecture. Like the Hotel Ullensvang, the Kviknes dates back to the middle of the 19th century so surely they would have a ghostly encounter or two to report. Much to my disappointment, there are no resident ghouls but the owners and staff have admitted to feeling frightened when they walk the corridors alone at night. I can see why! The quaint and charming Fretheim Hotel in Flåm holds many secrets as well. My favorite haunt of all resides in the Fretheim Hotel in Flåm, end of the line of the renowned Flåm Railway that runs from Myrdal to this storybook village on the Sognefjord. After the hotel's owner's wife passed away in 1909, his cousin, Marthe Fretheim, assumed operations and managed the hotel until her death in 1933. However, she is reputed to continue overseeing operations to this day according to Mette, the Fretheim's manager and a local resident. Our resident spirit Marthe Fretheim still manages the hotel from the other side. Eerily enough, her eyes in this portrait appear to follow you around the room or from side to side on your monitor. Sometimes while working in her office when she's alone in the hotel, Mette explained how she's heard Marthe roaming the halls on the floors above her. She added that oftentimes her set of keys would go missing and after repeated offenses, Mette finally relented and had a spare set made just for Marthe. Mette's keys never went missing again. Although Marthe is considered a kind and friendly spirit, this one encounter and my favorite, firmly attests to her feisty spirit, pun intended. 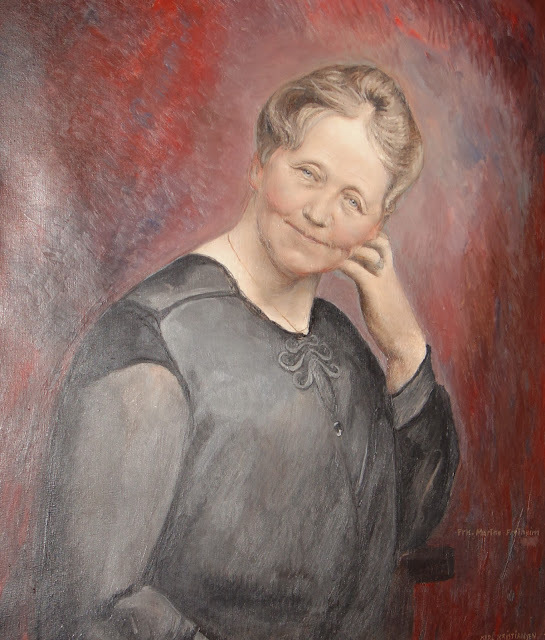 During a recent renovation to the hotel, specifically in the rooms where Marthe lived when she was alive, one of the workers was struck on the shoulder. Obviously she objected to his restoration efforts. As you can probably imagine, he never again returned to work. 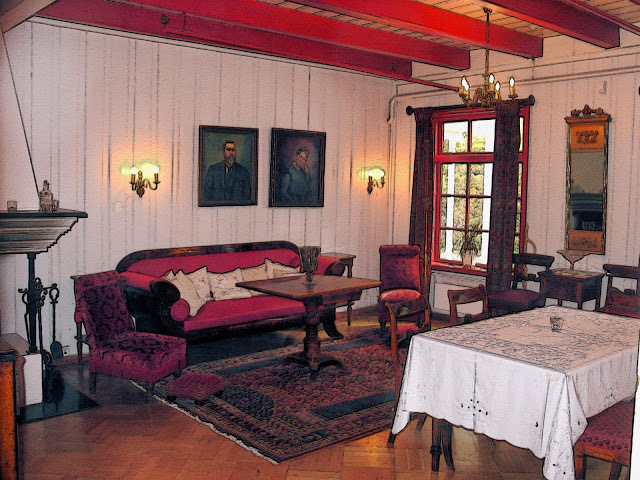 Marthe's living room appears as it was when she was alive. You can see her portrait above the couch. Whether you believe in ghosts or not, you must admit that these stories are quite fascinating. I for one believe! 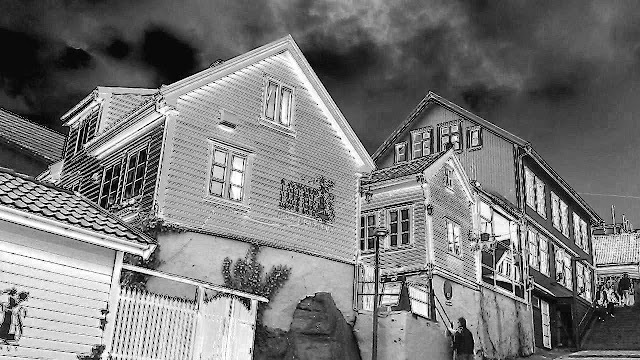 I hope you enjoyed our ghost hunt through Norway and the next time you're visiting an old inn, ask your guide about the visitors from the "other side." Most of all, beware of things that go bump in the night, a mysterious tap on the shoulder, whispers in the dark. Read more about the fascinating histories of each of these inns in Norway: Then and Now. You'll see how each of them have grown from humble beginnings to the magnificent lodges they are today! Special thanks to Innovation Norway and Fjord Norway, both of whom made this trip possible! As always, my opinions and thoughts are mine and mine alone, however in light of this post, they may have been altered by other-worldly presences. Love your spooky post. When we were in Norway last summer, my friend decorated her attic with an antique nightgown...yes! We were seeing ghosts! Hi there Corinne and thank you so much for your kind words!! I had a lot of fun putting this together. Glad you liked it!! Would love to have been there in that attic. What fun! Very spooky stories! I don't think that anyone could convince me to sleep in a haunted hotel room - there wouldn't be a chance that I would sleep a wink. If I had to have a ghost around though, I would hope for one like Mother Utne - it would be rather handy to have someone returning objects to their rightful places! Hi there Lisa and thank you so much for your comment. I had a great time on my little ghost hunt in Norway and was quite fascinated by each of the tales. I only wish I could have done more!! I had to laugh at your remarks about not getting a wink of sleep...I probably wouldn't either but oh what fun would it be! This was a wonderful story, Jeff. Your images are exceptional -- I just love this! Hi there Susan and thank you so much for stopping by and for your kind compliments! Coming from you, I am truly honored!! Thank you!!! Lol, what fun exploring spooky inns! I actually saw a ghost once myself, and I wasn't exactly a believer until it happened to me! Wow! I wish I would have seen one during my ghost hunt! What was it like? Tell me more of how it all happened. Thank you for stopping by too! Hi there Charu!! Thanks so much for stopping by and for your kind words!! Room 15 is a spooky one indeed. Hi there Mike! How funny my friend. I think I could do it as long as someone else was in the room with me. Never would I go it alone though! Thank you for your kind compliments and for stopping by to share your thoughts!! I shouldn't have read this right before going to bed :) This was such a great read though. While I love spooky stories, I'm also a scaredy cat at heart who will probably never sleep in a haunted hotel if I can help it. I love the eerie effects you did on the pictures. HI there Mary and thanks so much for stopping by! You know, as I was writing this, I too was getting a little spooked. My imagination tends to run amok when reading, watching or writing spooky tales so I can relate. But you know, if I don't get spooked, that's a sign that it's probably not very scary to begin with. I love peeking thru my hands while watching movies...fun! Thank you for all of your kind words my friend!! Love this post, Jeff! Spooky stories are better read, maybe heard, than experienced. Unlike you though, even with company, I wouldn't want to be in any of these inns. Did the ghosts assist or did you add a spooky touch to the photos? LOL! I tried and tried but those pesky poltergeists kept interfering with the lens and what you see above is the result. ; ) Thanks so much for stopping by Mette!! Much appreciated! Oh my goodness, this is really the downside of historic properties. I found myself fireside at a B&B in Inverness with members of the Scottish Ballet, once upon a time. Everyone was telling local ghost stories. Absolutely terrifying. I didn't sleep a wink that night in my atmospheric attic room. Ghosts, real or imagined, do not make for a restful night! Great post! I'm a huge sucker for a ghost story and I've always wanted to visit Norway! I'm truly jealous of this one! Hi there Mags! Thank you for stopping by and for your kind words!! It was truly fascinating to learn about all of these departed ones!! And fun too!